This is i smaller CTF/Capture map that's somewhat of a combination of two ideas that weren't large enough for their own map. 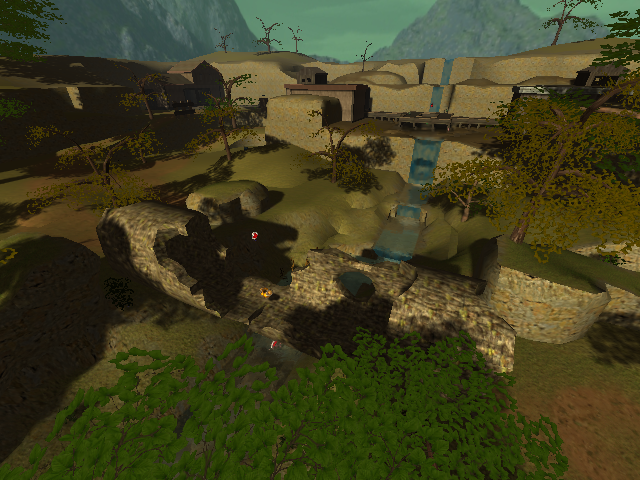 This is a map set in a low part of a hilly area and has two main levels. The upper level has buildings and more complicated, restricted paths, while the lower level is a more open natural setting. Tunnels in the upper section loop around behind the main team base, but will not take you between the two sides of the map. Pistol : 0 //a map by me with no pistol ammo? what is this madness? I will not be able to respond to any questions or address any issues regarding this map for a few days, due to life. However, I look forward to constructive feedback. (or just rip the map apart with criticism, whatever) If anyone wants to help with lighting or weapon placement, go right ahead. Lighting is usually my weakest area, and people rarely play normal CTF, so I really have no idea what works where for it. --UPDATE-- FIXED .OGZ and .WPT files! The problem had to do with pretty much what I was asking about a few days ago in my "Missing or hidden waypoint file" post. You'd think that after having the problem once, I would have expected it again, but NOPE. Well, hopefully it won't happen again in the future. -In gulley.txt: "Also added a small cave behind a waterfall"; There is no such cave. -Either clip, or better yet resize, the collision box on the large trees. Atm, you can hide inside them. -5 places where the geometry is broken beneath the top-most waterfall. -5 spots with w/ unnecessary texture stretching at the bottom-most waterfall. -multiple geometry hiccups inside the bottom-most waterfall. -1 stray cube sticking out of the wall by the bottom-most waterfall. -2 cubes w/ unnecessary texture stretching in the hole in the bridge thing on the lower section of the map. -1 more cube w/ unnecessary texture stretching in the crack in the middle of the same bridge. -1 spot where the bridge/log thing is mistextured as rock; seen in the other crack in the bottom if it. -Autograss that grassy/mossy texture, and tweak the grasscolour to match. -Maybe use some smoke particles to hide the hard edge of the water at the bottom of the waterfalls. -Use some texture blending. I'd recommend blending some moss on the top of that bridge/log thing on the lower section of the map. -Better overall lighting. Don't be afraid to light those caves a little. -Maybe add a little(just a little) fog and color it to match the skybox.